Being the wife of one of the famous footballers in the world right now means everyone wants to know all the details about your life, which is one thing that poses a challenge to Eden Hazard’s wife. The Chelsea F.C. star is married to his high school heartthrob Natacha Van Honacker and unlike most women linked to popular athletes, the Belgian beauty is no fan of the spotlight and prefers a quiet life with her family to the complications that often come with the limelight. The much we could gather about the life of Natacha Van Honacker will enlighten you on some of the fascinating facts to know about her. For starters, she plays a key role in the career of the Belgian soccer player she is married to and has been by his side since the beginning of what is now revered as an illustrious career. 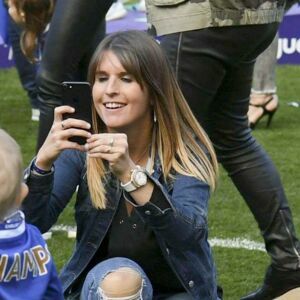 A camera-shy person, Natacha Van Honacker has not revealed much about what her life looked like before she became Hazard’s wife. Aside from the fact that she was born in Belgium where she also grew up, the particular date of her birth has not been made public. Likewise, nothing is known about her parents and siblings, if she has any; and just like her background details, her education or what she does as a career is not known. Notwithstanding her reservations, it is known that Natacha Van Honacker was a teenager at the time she met Hazard. Though her shyness stood in the way of interacting with him, Eden couldn’t hold back his emotions and was even more attracted to her because of her shy nature. The spark was too bright to ignore and it turned out to be love at first sight for the two. They started dating immediately after making each other’s acquaintance and soon, that relationship produced a child while Natacha was still in high school and yet to officially marry Hazard. Though Natacha Van Honacker does not have as big a profile as that of Eden Hazard, she also played soccer while in school. Apparently, her prowess in the sport wasn’t enough to take her to higher levels but it remains one of the things she shares in common with her husband. She also has a penchant for the game of badminton and plays chess as well. In the absence of details about her birth family, Natacha Van Honacker plays the role of a caring wife and capable mom to her husband and three children. She met Eden Hazard through a mutual friend when she was in her teens. The two were at a gathering together but Natacha didn’t notice Eden at first though the latter was smitten with love for her at first sight. Her shy nature was the main attraction and after dating for a while, they had their first son on December 19, 2010, and named him Yannis. Natacha was still in high school at the time and after her graduation in April 2012, the couple sealed their love in a low-key wedding ceremony. At this time, she moved in with her husband and in February 2013, they welcomed a second son named Leo. Another child, a son named Samy, joined the family in September 2015. London is one place Natacha would love to raise her children. Additionally, she wouldn’t want to push them to follow a particular career path, in as much as she wants their father to be their role model. Natacha Van Honacker has always stayed far from the limelight but this has not hindered her activities as Eden Hazard’s number one fan. As such, she uses her Facebook page to send out posts with the major focus on cheering her husband and his teammates. Natacha Van Honacker likes to cook for her family and is always excited about an opportunity to explore new recipes. She loves Sizzlers a lot and has a secret recipe for delicious pizzas. She also loves to read. When she is not busy cooking up a storm in the kitchen, Natacha might be caught on a vacation with her family in locations like New York and Paris.